Per his initial military service record (Depot), Samuel Mathew Tancred was born at Waterloo, Sydney, N.S.W. He gave his age as 25 years and 10 months, his marital status as single, and his occupation as labourer. His next of kin was listed as his mother, Mrs Tancred, Botany Street, Waterloo, N.S.W. He claimed that he had no previous military service. He listed his postal address as ‘Geurie Post Office’, on his initial Application to Enlist in the Australian Imperial Force form. His description on his Certificate of Medical Examination was height 5 feet 6 inches tall, weight 140 lbs., with a fair complexion, blue eyes, and brown hair. His religious denomination was Roman Catholic. He claimed that he had no previous military service. The Wellington Times reported that ‘S. Tankered’ was one of five recruits that left Geurie by train to join the Coo-ees on Monday night 25th October 1915. They stopped at Wellington for their medical examinations, then caught the train to Blayney to join the contingent. Samuel Tancred completed his medical examination at Wellington with the other Geurie recruits on Tuesday 26th October 1915, and was attested the same day by Captain A. C. Eade at Blayney. After completing the Coo-ee March he went to Liverpool Camp as reinforcement for the 1st Light Horse Regiment. On 10th January 1916 Trooper Tancred was charged with being absent from Musketry Parade on 7th January 1916, and being absent without leave on 8th and 9th January 1916. He was fined 20 shillings for the first offence, and 3 days pay for the second. On 29th January 1916 Trooper Tancred was charged with being absent from 9.30 am parade without leave. He was fined 1 pound and confined to barracks for 4 days. On 1st February 1916 Trooper Tancred was charged with being absent from duty. He was fined 1 pound and confined to barracks for 14 days. On 7th February 1916 Trooper Tancred was charged with unlawfully disposing of Government Property. He was fined 2 pounds and sentenced to 14 days in Darlinghurst Gaol. On 21st February 1916 Trooper Tancred was charged with breaking from guard tent whilst under arrest. He returned to the camp 2 days later and was held for discharge. On 22nd March 1916 Trooper Tancred was discharged with Ignominy. Samuel Tancred re-enlisted in the A.I.F. on 1st April 1916 at Bathurst, N.S.W, under the name of Samuel Mathew Bousfield. He was assigned regimental no. 2269, and allocated as a reinforcement for the 45th Battalion. On 10th May 1916 Private Bousefield was charged with overstaying his leave by 44 hours from 0100 on 7th May 1916 till 2100 on 9th May 1916. He was fined 2 days pay. On 5th June 1916 Private Bousefield deserted from Kiama Camp, and a warrant was issued for his arrest. [This warrant was withdrawn on 30th January 1919]. He re-enlisted in the A.I.F. again on 29th October 1917 at Brisbane, Queensland, under the name of Samuel Mathew Tancred. He gave his age as 21 years and 9 months in this application. He was assigned regimental no. Q21677, and allocated to the Engineers and sent to the Engineer Depot. 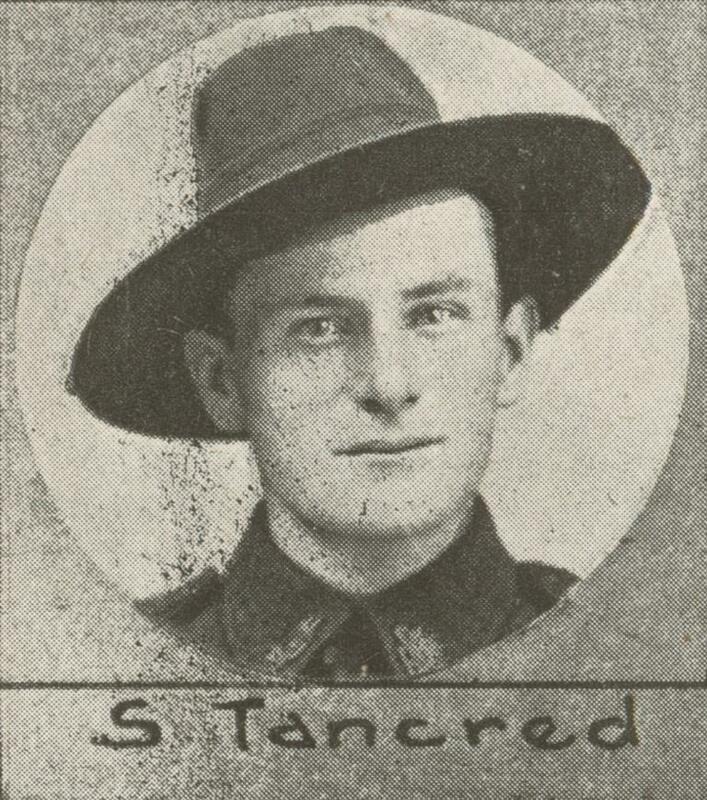 On the 20th of November 1917 Sapper Tancred was transferred to the Miners. On the 11th of December 1917 Private Tancred was transferred to the 2nd Military District Engineer Reinforcements, and sent to Moore Park Engineer Depot in Sydney. Sapper Tancred was discharged medically unfit on 8th February 1918 due to Tachycardia ‘probably due to excessive cigarette smoking’. Note: A statement from his mother Mrs Bousfield dated 11th January 1945 in his service record states that her son’s name was ‘Samuel Matthew Bousfield’, and that he had ‘enlisted in 1915 at the age of 18 years’ under her maiden name. Per his military service record (Depot), John Brennan was born at Brisbane. He gave his age as 32 years and 2 months, his marital status as single, and his occupation as dealer. His description on his medical was height 5 feet 4 inches tall, weight 132 lbs., with a dark complexion, brown eyes, and black & grey hair. His religious denomination was Roman Catholic. He claimed that he had no previous military service. John Brennan completed his medical examination on 26th October 1915 at Wellington (8 days after the Coo-ees had left through that town), then travelled to Blayney to catch up with the Coo-ees. He was attested at Blayney by Captain Eade on 26th October 1915. He claimed that he had no previous military service. His address was recorded as ‘P.O. Geurie’ on his initial Application to Enlist in the Australian Imperial Force form . It appears that John Brennan may have been one of the four unnamed men reported in the Wellington Times who signified their intention of joining the Coo-ee March at the appeal made at the Church of England Ball the night the Coo-ees stayed at Geurie on 15th October 1915. The Farmer and Settler reported that five men arrived to join the Coo-ees at Blayney on the 26th October 1915, by the late train from Geurie. The Dubbo Liberal and Macquarie Advocate named ‘J. 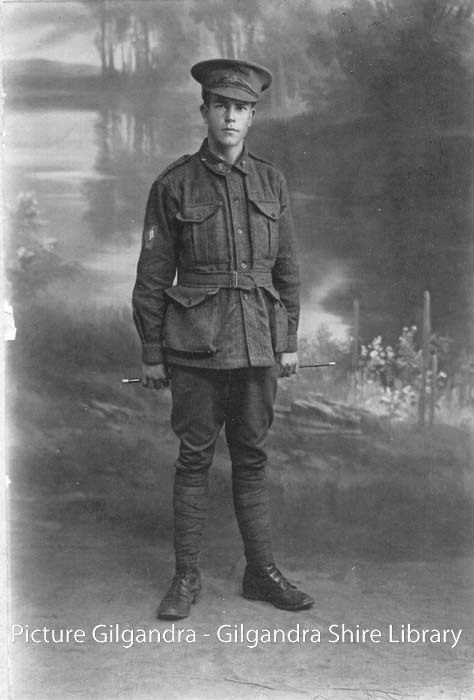 Brennan’ as one of four recruits from Geurie that caught the evening mail train at Wellington to join the Coo-ees at Blayney, (joining A. Lynne [known as a Gilgandra recruit] and W. Smith, who had caught the train at Geurie). After completing the march he went to Liverpool Camp as reinforcement for the 13th Battalion. On 17th November 1915 Private Brennan went before a Medical Board at Liverpool Camp, where he was diagnosed to suffer from varicocele, and unfit for active service. On 4th December 1915 Private Brennan was discharged from the A.I.F. as medically unfit. Per his military service record (regimental no. 4816), Thomas Jackson was born at Longford, Derby, Derbyshire, England. He gave his age as 32 years and 2 months, his marital status as single, and his occupation as labourer. His description on his medical was height 5 feet 5 ½ inches tall, weight 146 lbs., with a fair complexion, brown eyes, and dark hair. His religious denomination was Church of England. He claimed that he had no previous military service. Thomas Jackson had come to Australia about 1911, when he was 28 years of age. The Wellington Times recorded “Jackson” as one of the four recruits who stepped forward offering to join the Coo-ee March when the Coo-ees recruited at Geurie on 15th October 1915. He completed his medical on the 16th October 1915 at Wellington, and was attested at Dripstone by Captain Nicholas on the 19th October 1915. On 2nd February 1916 Private Jackson was charged with being Absent Without Leave for one day. He was fined one days forfeiture of pay. On his embarkation roll his address at time of enrolment was Longford, near Derby, England, and his next of kin is listed as his mother, Mrs L. [Louisa] Jackson, Longford, near Derby, England. On 8th March 1916 Private Jackson along with many of the other Coo-ees departed Sydney on the HMAT A15 Star of England, and arrived in Egypt on the 11th April 1916. On the 3rd of May 1916 Private JACKSON was hospitalised at the 31st General Hospital at Port Said sick. He was discharged to duty on 2nd June 1916. Private Jackson proceeded overseas to join his unit in France [date and ship unknown], via England, leaving the 4th Training Battalion at Rollestone on 30th July 1916. He marched into the 4th Division Base Depot at Etaples in France on 1st August 1916. On 19th August 1916 he was taken on strength of the 13th Battalion whilst it was resting at Pernois, after just coming out of the line at Pozieres. On 25th September 1916 whilst the 13th Battalion was in action in the vicinity of Voormezeele, Belgium, Private Jackson was admitted to the 12th Australian Field Ambulance suffering from Enteritis. He rejoined the Battalion on the 1st of October 1916. On 11th April 1917 Private Jackson was with the 13th Battalion when it launched an unsuccessful attack on the Hindenburg Line in the vicinity of Bullecourt, France. During this attack Private Jackson was wounded in action, receiving shrapnel wounds to his face and neck. He was evacuated to the 56th Casualty Clearing Station. On 13th April he was admitted to the 11th Stationary Hospital at Rouen. On 14th April he was admitted to the 2nd Convalescent Depot at Rouen. On 21st April he was discharged and sent to the 4th Australian Division Base Depot at Etaples. On 30th April 1917 he rejoined the 13th Battalion whilst the Battalion was conducting training at Ribemont, France. On 28th May 1917 Private Jackson was charged with being Absent Without Leave from Tattoo roll call on 24th May 1917 from 9.00 pm to 9.45 pm whilst the Battalion was in training. He was fined one days pay. On 16th June 1917 Private Jackson was with the 13th Battalion when it was manning support trenches in the vicinity of Messines, Belgium. Private Jackson was one of two men killed from the 13th Battalion that day. Another five men were wounded. Per his service record he was “buried N. of Hill 63 and about 250 yds N.E. of thatched cottage and about 100 yds West of above, close to Old Dugouts of support trench 1 ¾ mls S.S.W of Messines France”. However, Private Jackson’s grave could not be located after the war, and his name is remembered on the Menin Gate Memorial at Ieper (Ypres), Belgium. Private Jackson’s name is commemorated on panel 69 on the Australian War Memorial First World War Roll of Honour. His name is also remembered on the St. Chad’s Church War Memorial, at Longford in Derbyshire, England. Per his military service record (regimental no. 4807), William Emerton Hunter was born at Sydney, N.S.W. He gave his age as 21 years and 1 month, his marital status as single, and his occupation as wheat lumper. His description on his medical was height 5 feet 11 inches tall, weight 172 lbs., with a fair complexion, blue eyes, and brown hair. His religious denomination was Church of England. He claimed that he had no previous military service. He joined the Coo-ees at Geurie. He completed his medical on the 16th October 1915 at Wellington, and was attested at Dripstone by Captain Nicholas on the 19th October 1915. According to newspaper reports, money raised from a collection made for Mrs Hunter was sent home with Private Hunter, who was allowed to go home for a few days to spend some time with his mother. 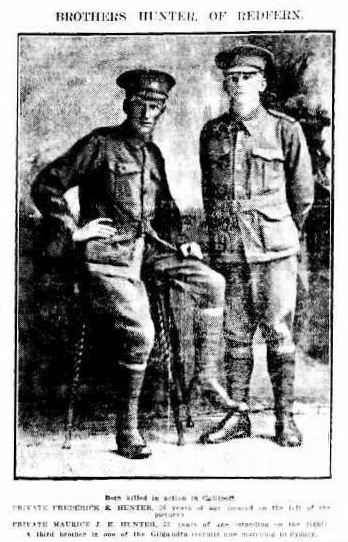 This photograph of Private Hunter’s two brothers Frederick and Maurice Hunter was published in The Sydney Morning Herald on 1st November 1915 with the caption “Brothers Hunter of Redfern both killed in action at Gallipoli … a third brother is one of the Gilgandra recruits now marching to Sydney”. After completing the Coo-ee March Private Hunter went to Liverpool Camp as reinforcement for the 13th Battalion. On Private Hunter’s embarkation roll his address at time of enrolment was 50th Young Street, Redfern, N.S.W., and his next of kin is listed as sister, Miss A. Hunter, 50th Young Street, Redfern, N.S.W. (On his attestation paper in his service record his next of kin is listed as mother, Mrs F.[Fanny] Hunter, 50A Young Street, Redfern, N.S.W, which is crossed out and changed to sister, Miss Annie Hunter, 50A Young Street, Redfern, N.S.W. His sister Annie Hunter’s name is also mentioned in other documents in his service record). On 8th March 1916 Private Hunter along with many of the other Coo-ees departed Sydney on the HMAT A15 Star of England, and arrived in Egypt on the 11th April 1916. On the 19th April 1916 Private Hunter was transferred to the 45th Battalion at Tel-el-Kebir. On the 2nd June 1916 Private Hunter left Alexandria aboard the transport Kinfauns Castle bound for France, arriving at Marseilles on the 8th June 1916. Private Hunter served with the 45th Battalion during its first action at Fleurbaix, France in July 1916. Private Hunter then moved with the 45th Battalion to Pozieres, France, in early August 1916. Private Hunter was killed in action in the vicinity of Pozieres, France, on 7th August 1916. He had initially been reported wounded in the field on 7/8th August 1916, then was posted as wounded & missing. Following a court of enquiry on 26th April 1917 he was officially reported killed in action on 7th August 1916. Private Hunter has no known grave. 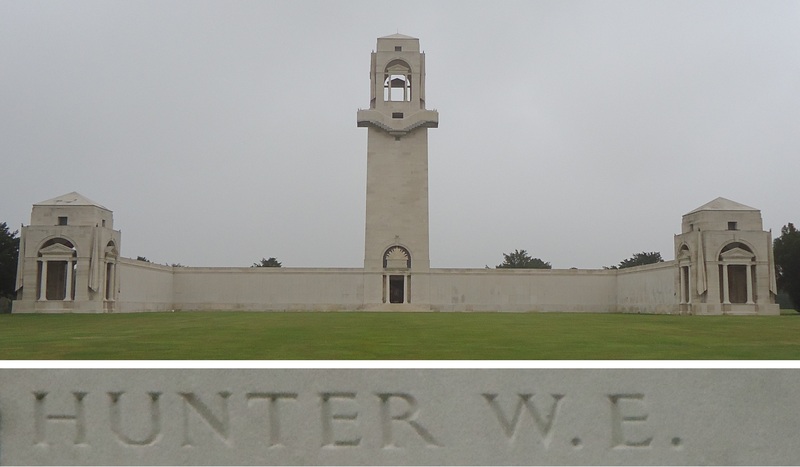 Private Hunter is remembered on the Australian National Memorial at Villers-Bretonneux in France. 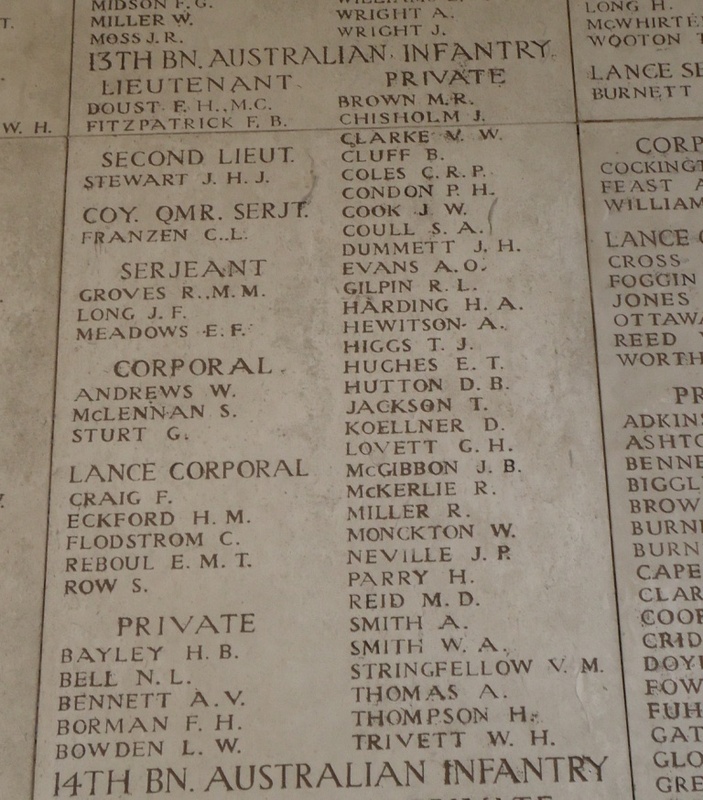 Private Hunter’s name is commemorated on panel 139 on the Australian War Memorial First World War Roll of Honour. His name is also listed on the Redfern War Memorial (along with the names of his two brothers). Note: Having already lost 2 sons to the war, after her son William was posted wounded and missing in 1916, Mrs F. Hunter moved to a war widows’ home later that year in The Boulevarde, Sans Souci, which had been built for her by the Kogarah branch of the Voluntary Workers’ Association, and named “Coo-ee” in memory of the third son who had ‘marched with Hitchen’s Coo-ees’. Per his military service record (regimental no. 4834), Alfred Rupert Clyde Lingstrom was born at Dubbo, N.S.W. He gave his age as 21 years, his marital status as single, and his occupation as Postal Assistant. His description on his Certificate of Medical Examination was height 5 feet 6 ½ inches, weight 112 lbs., with a fair complexion, grey eyes, and light brown hair. His religious denomination was Methodist. He completed his medical examination on 13th October 1915 at Dubbo (the day the Coo-ees arrived in Dubbo), but was not attested until 26th October 1915 at Bathampton (after he had caught up with the Coo-ees). He claimed to have had no previous military service. He stated that he was a member of the Geurie Rifle Club. An article in the Wellington Times dated 28th October 1915 reported that ‘Mr. [W. W.] Smith and Mr. Lynne responded to the call for recruits when the Coo-ees from Gilgandra spent a night in Geurie’ [on Friday 15th October 1915], ‘but neither could join immediately, as the former had a big task in handing over all the shire books to his successor, and Mr. Lynne had to remain in his position at the local [Geurie] post-office till a relief man could be sent along’, and that ‘Mr. Lynne himself hails from the home of the Coo-ees (Gilgandra) so should find himself among friends when he joins them’. Alfred Lingstrom, reported as “A. Lynne” in The Dubbo Liberal and Macquarie Advocate, following a send off provided by the Geurie community, travelled by train from Geurie with fellow Geurie Coo-ee William Smith on Tuesday 26th October 1915, to catch up with the Coo-ees at Blayney. He was known as one of the Gilgandra Coo-ees. After completing the remainder of the Coo-ee March, he went to Liverpool Camp as reinforcement for the 13th Battalion. Private Lingstrom attended a Signal School at Liverpool from 25th December 1915 to 2nd February 1916. On his embarkation roll his address at time of enrolment was Warren Street, Gilgandra, N.S.W., and his next of kin is listed as his mother, Mrs. E. [Emily] Lingstrom, at the same address. Private Lingstrom, along with many of the Coo-ees, departed Sydney on the HMAT A15 Star of England on 8th March 1916, as 15th reinforcement for the 13th Battalion. He arrived in Egypt on 11th April 1916. On the 16th May 1916 he was transferred to the Signal Section of the Engineers Training Depot at Tel-el Kebir. On the 15th October 1916 Private Lingstrom was taken on strength of the ANZAC Mounted Division Signal Squadron at Romani. On 1st February 1917 Private Lingstrom was sent to hospital sick. On 12th February 1917 he was admitted to the 14th Australian General Hospital at Abbassia, Egypt, suffering from Bronchitis. He was transferred to a Convalescent Depot on 20th February 1917. On 9th March 1917 Private Lingstrom was charged with (1) breaking out of barracks about 6 p.m. and remaining absent until apprehended by the Military Police about 7.30 p.m. on 8th March 1917, (2) being out of bounds by being in Wagh el Burka Street, and (3) neglecting to obey Garrison orders by not wearing identity discs. He was awarded 3 days confined to barracks and fined 4 days pay. On 12th March 1917 Private Lingstrom was sent to the 1st Light Horse Training Regiment at Moascar, Egypt. On 20th March 1917 he was moved to the Base Signal Depot at Alexandria, Egypt. On 27th of April 1917 he rejoined the ANZAC Mounted Division Signal Squadron. On 9th May 1917 Private Lingstrom went to hospital sick. He was admitted to Citadel Military Hospital in Cairo, Egypt, on 12th May 1917, suffering from Debility. He was discharged to a Convalescent Depot at Abbassia, Egypt, on 19th May 1917. On 30th May 1917 Private Lingstrom was charged with overstaying his pass from 8 p.m. until apprehended by the Military Police about 9.40 p.m., and being out of bounds, on 28th May 1917. He was fined 2 days pay. On 2nd June 1917 Private Lingstrom was transferred to the British Red Cross Convalescent Depot at Montagah, Egypt. On 14th June 1917 Private Lingstrom was discharged to the Base Signal Depot at Alexandria, Egypt. On 28th July 1917 he rejoined the ANZAC Mounted Division Signal Squadron. On 28th January 1918 Private Lingstrom was charged with whilst being on active service for failed to salute an officer on 25th January 1918. He was awarded 5 days confined to camp. On 2nd March 1918 Private Lingstrom was sent to the Base Signal Depot at Alexandria, Egypt. On 28th March 1918 he rejoined the ANZAC Mounted Division Signal Squadron. On 11th August 1918 Private Lingstrom was sent to a Rest Camp at Port Said, Egypt. On 1st September 1918 he was sent to the Signals Training Unit at Moascar, Egypt. On 12th February 1919 he rejoined the ANZAC Mounted Division Signal Squadron. On 6th March 1919 Private Lingstrom was promoted to Temporary 2nd Corporal. He was promoted to 2nd Corporal on 24th June 1919. 2nd Corporal Lingstrom began his return to Australia aboard the H.T. Malta at Kantara, Egypt, on 3rd July 1919. He arrived in Australia on 10th August 1919, and was discharged on 3rd October 1919.